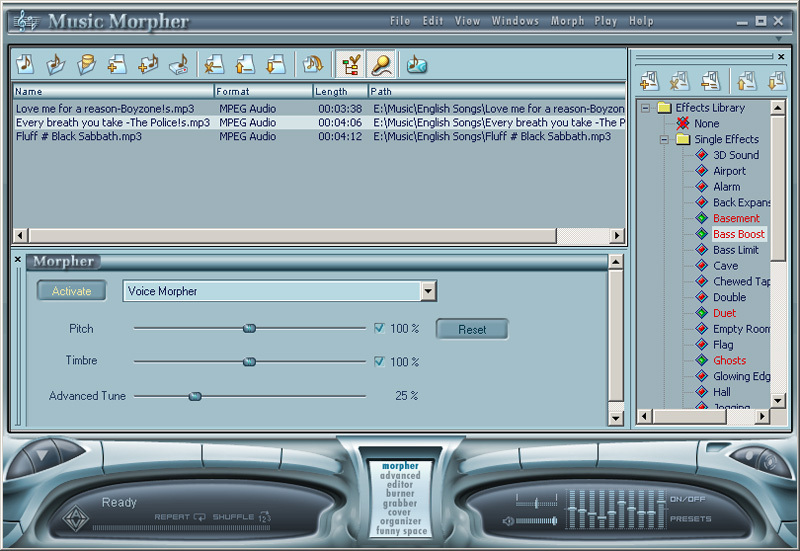 Download AV Music Morpher here for free and get an all-in-one video editing program with many built-in modules. AV Music Morpher is an audio editor with advanced features for music mixing and editing, which can meet the needs of professionals as well as beginners. You do not need a recording studio anymore. With AV Music Morpher you can make music and song remixes, change voice and tempo, add effects and edit your masterpieces in many popular file formats, including MP3, WMA, WAV, APE, OGG, NIST, AU, etc. AV Music Morpher has among other things a built-in video player, a "voice-changing" video voice dubbing, video clips generator, DVD conversion equipment as well as a sound recorder. One of the main modules of the program is the music morpher which makes it possible to change the pitch and timbre of any voice speed up or slow down the pace. Try it out on your own voice. Find AV Music Morpher, mark it and choose "Uninstall"
Should AV Music Morpher has been damaged or corrupted and thereby difficult to remove we can recommend you finding help to uninstall it here.